Today, Leica, Panasonic and Sigma have announced the L-mount alliance for mirrorless cameras at Photokina 2018. As part of an effort to make their respective offerings more competitive against the dominant market players, all three firms will be developing products for the Leica L-mount, allowing photographers to mix and match cameras and lenses at will. The Leica L-mount first debuted in 2014 along with the announcement of the Leica T. Since then it has been used in the Leica SL full-frame system, as well as the Leica CL, TL and TL2 cameras. Its short distance of 20mm between lens mount and sensor allows for construction of extremely compact lenses. Leica is well known for producing high-quality but extremely expensive cameras and lenses. It’s likely that this move is seen as a way to introduce less affluent users to the Leica ecosystem, while also allowing Panasonic and Sigma to benefit from the well-regarded Leica stamp of quality. Panasonic also has a history of co-operating with Leica, as many Micro Four Thirds lenses compatible with its Lumix cameras bear the Leica name. 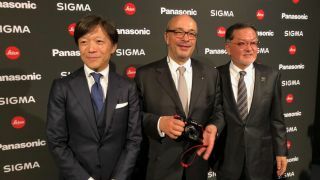 Sigma has stated that it will be expanding its existing lines to the L-mount, including the high-quality Art range of lenses. Panasonic has revealed that its new full-frame Lumix S1R and Lumix S full-frame cameras will carry the L-mount. Keep an eye on our Photokina 2018 news round-up as we bring you all the latest developments from the show.